I meant to write this post on Wednesday about Tuesday, but unfortunately I was in a minor car accident — a fender bender, really — which, while not severe in any shape or form, did eat away at my day. (Before you ask: I seem to be fine, the car is now in the shop but likely doesn’t require any major repairs, and no it wasn’t my fault (I was rear-ended while stopped in a right-hand turning lane, waiting for a gap in traffic so I could pull out).) So now I’m writing my posts all out of order, but this post will be backdated to Tuesday, which is when I actually made the pancakes. I’ve written about Shrove Tuesday, also known as Pancake Tuesday before, since it was a yearly tradition in my family growing up. In all of the hustle and bustle with travel (and my remaining jet lag) this year I’d almost forgotten about it, but somebody’s post on Facebook reminded me just in time. Not that pancakes for supper are limited to one day a year, mind. 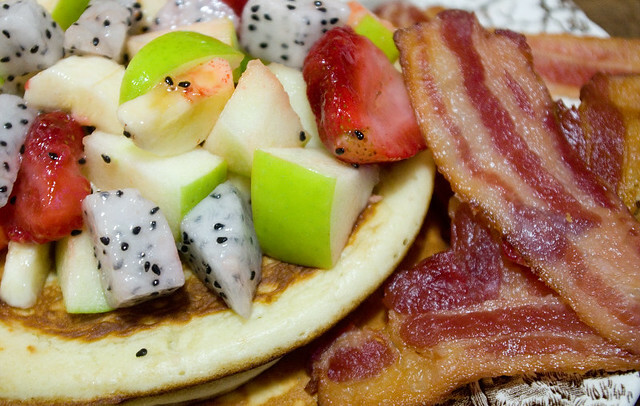 Some days I just feel like pancakes. This year I went with Basic Pancakes from the Joy of Cooking (Rombauer & Becker, 2006 edition); I’m not sure what page of the hard copy book, though, since this time I used the app (super-convenient, that thing). However, I discovered too late to go to the shops that I was low on eggs and completely out of butter, so I substituted half a mashed banana for an egg and canola oil for the butter. My substitutions seemed to work just fine since these pancakes were very fluffy and mighty tasty! 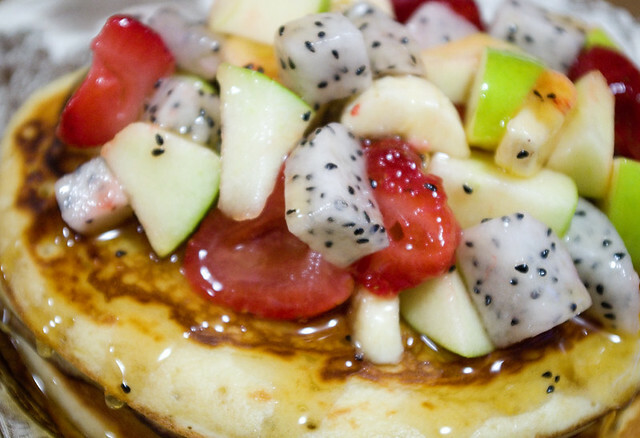 I topped them with a fresh fruit salad of Granny Smith apples, dragon fruit, strawberries and more bananas, along with lots of maple syrup. And, as is pretty much a constant request in this family, I served bacon on the side. 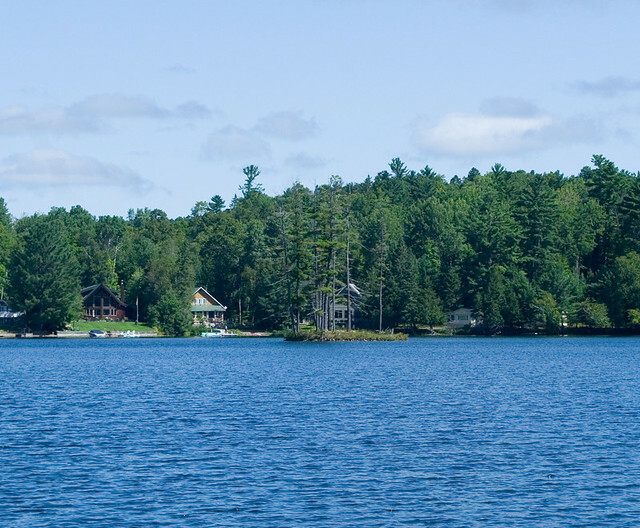 This past week I was lucky enough to spend a last few days of summer vacation at the cottage that my parents are renting. We did take a day trip while we were there (which I will write about at a later date), but the rest of the time was spent relaxing. Thing 1 and Thing 2 discovered the joys of toaster waffles. I honestly don’t think I’d ever bought them for them before. 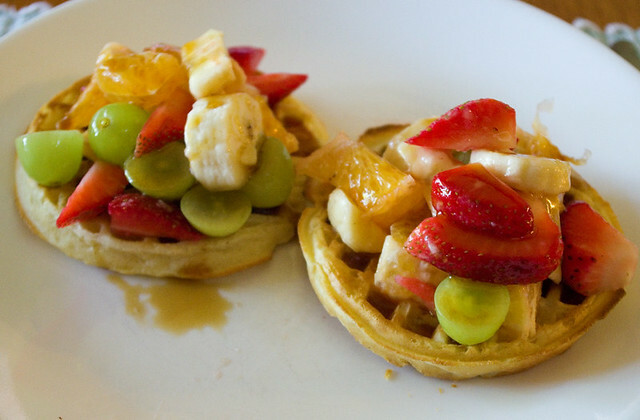 I tried to make mine just a little more healthy by adding fruit salad (oranges, bananas, grapes, and strawberries). But I may have negated that healthiness by slathering it in maple syrup. The weather was beautiful and sunny, with only a few fluffy clouds in the sky. Despite the lovely sun, it wasn’t terribly warm, so we didn’t really feel like swimming. 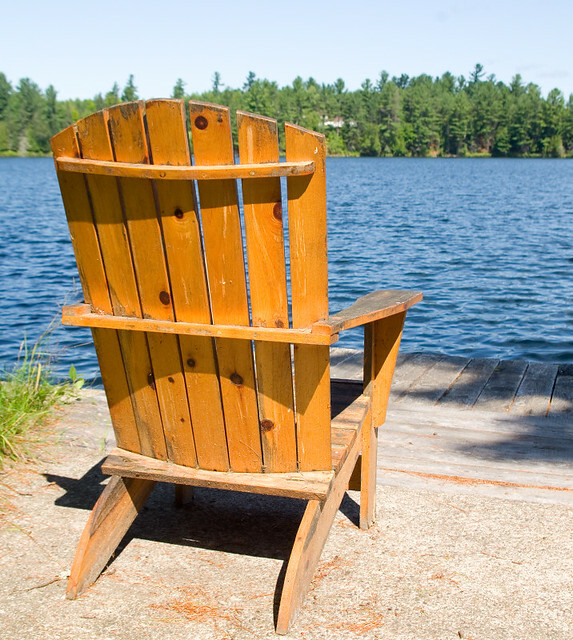 I spent most of my free time relaxing on the Adirondack chairs by the lake. 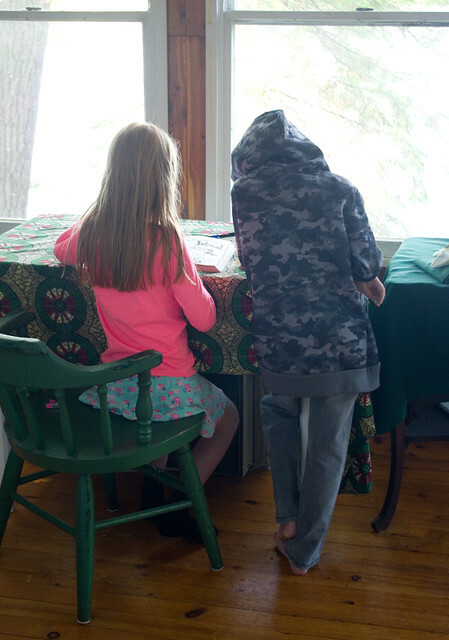 The kids, on the other hand, buzzed around like mayflies, alternating between crafting in the cottage and fishing with Gramps. Gramps caught a decent-sized perch and a rock bass, while Thing 2 caught two rock bass. 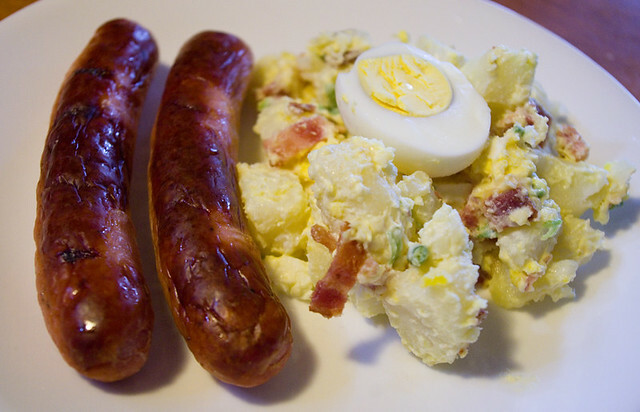 Dinner was baked sausages (bangers, I think), and Mom’s famous potato salad with bacon. 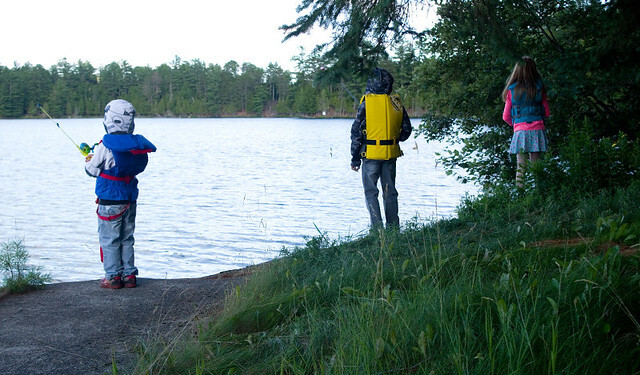 What a lovely way to end this summer’s lazy days at the cottage! We were lucky enough to get to spend a few days with friends at my parents’ rental cottage this week! With a good friend of mine and her two boys, it was a happy kind of chaos. 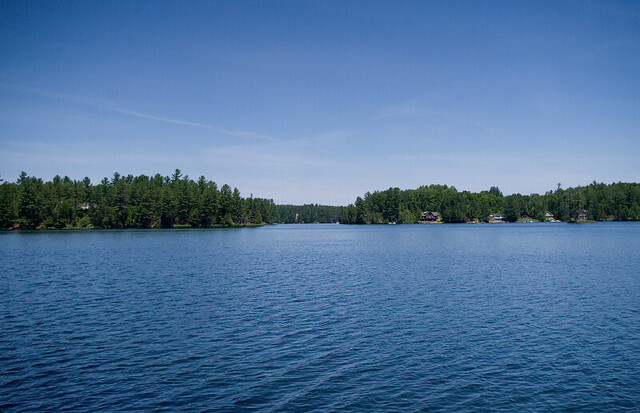 The weather was clear and hot, so most of the days were spent outdoors, either in, on, or beside the lake. 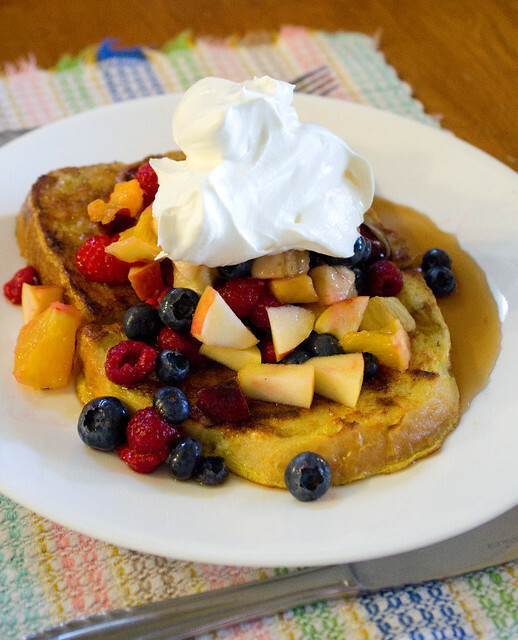 We started the day with a hearty brunch of French toast and fresh fruit salad, topped with a generous drizzle of maple syrup and a dollop of whipped cream substitute. 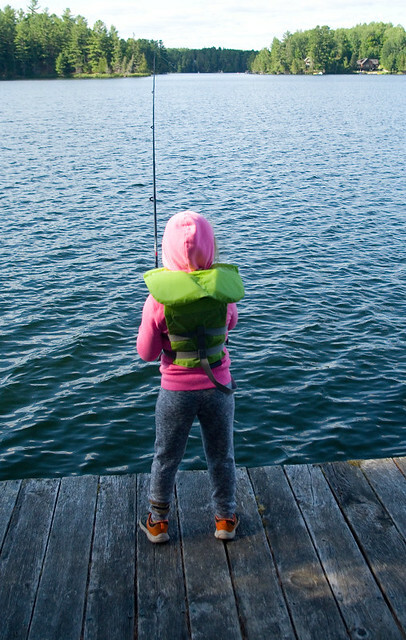 Then my dad took the kids out fishing. I’m pretty sure that was their favourite activity of the trip! We tried our hardest to keep the kids spaced far enough apart that they didn’t hook each other, but it was a challenge because of course they wanted to socialize. 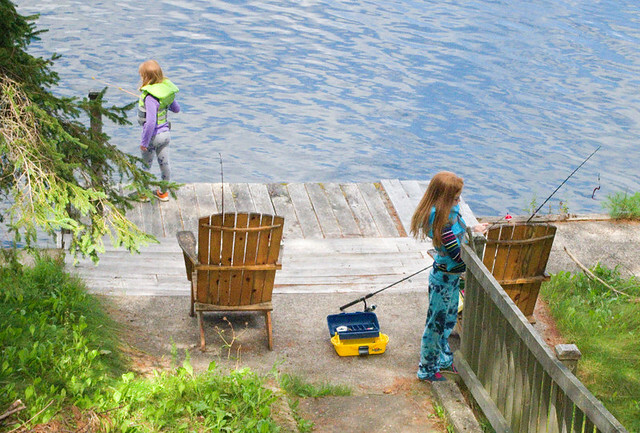 At one point before my friend arrived, Thing 1 and Thing 2 were out fishing with Gramps, and Thing 2 took a tumble off of the dock and into the lake. She was soaked, shaken, and a bit scraped up, but overall okay. 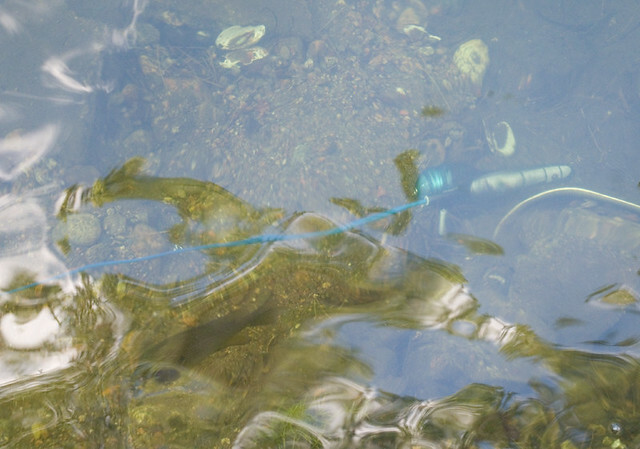 However, it wasn’t until the next day that my friend was able to retrieve Thing 2’s rod from the bottom of the lake. On a trip into town we discovered a really awesome second-hand book and gaming store. The older two quickly learned how to share the manga they’d scored. They were so absorbed in their book that I’m pretty sure they don’t know I took this picture. Dinner may not have been the most appetizing-looking, but it was delicious! My friend and I both set up our slow cookers at the start of the day so we could escape the kitchen. 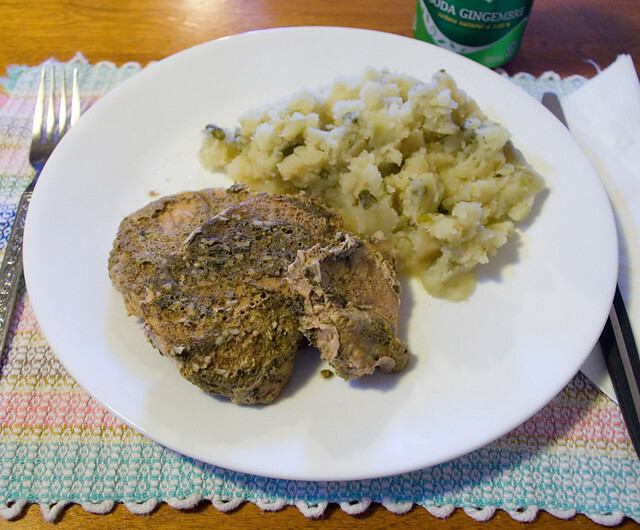 My friend made the pork chops are from this recipe, and I made mashed potatoes with garlic scapes and chicken broth (no recipe needed, just throw ’em all together in the slow cooker for 6 hours or so on low and mash it once the potatoes are soft). 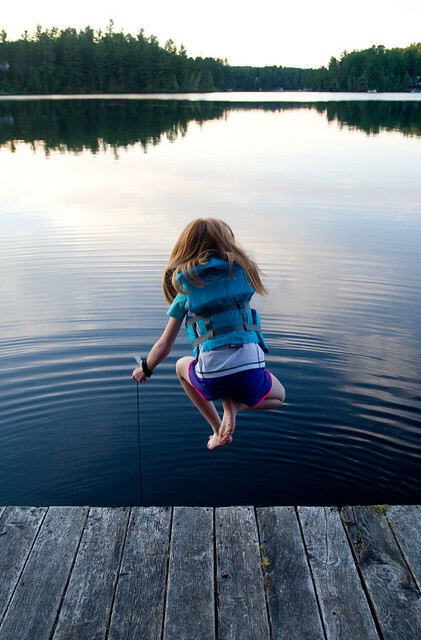 And of course after dinner was done, it was time to go jump in the lake! Last night I was running errands with the girls until just before dinner time, so I needed a quick, easy, and nutritious meal to feed the family. 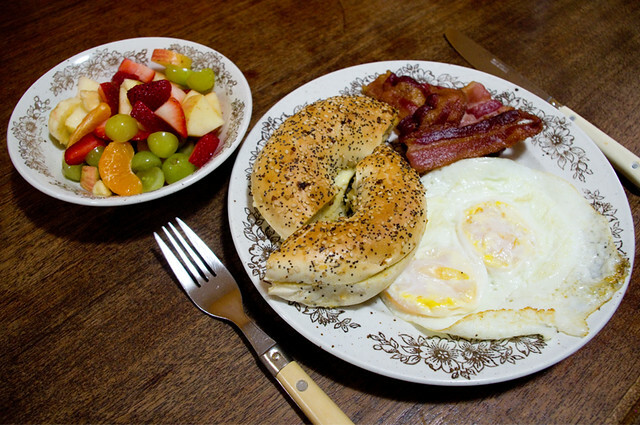 I chose bacon (cooked in the microwave — it’s much less messy that way), eggs (over easy or scrambled, depending on preference), enormous everything bagels from Costco, and a homemade fruit salad. It’s a good thing that I chose such a simple dinner, actually, because my brother-in-law popped by around dinner time. I don’t think he was originally planning to join us for a meal! However, it’s quite easy to throw on a couple of extra eggs and pieces of toast. My door is always open, but for some meals it’s definitely easier to “throw an extra potato in the pot”, as my mother would say.